Content is a constant treadmill. You have to keep making new content or updating old stuff if you want to keep your SEO high and your readers interested. The trouble is that there are only a finite amount of ideas in any single person’s head about a topic before the dreaded writer’s block hits. But there are ways to prime the content pump again and we’re going to share a powerful one with you. Follow this hack and you’ll soon be buzzing with new ideas for your content pieces. Books are our largest individual pieces of content. Authors have to pull together a lot of information to make a book. Amazon makes it easy to leverage this and we don’t mean by giving Amazon a ton of money. Check this out. Amazon publishes the top 100 sales in all of their categories, paid and free. These lists are updated hourly. Every niche you can think of has a book category on Amazon if you know where to look. Anyone from a B2B niche business to a DUI lawyer can find something related to their field that their audience might be interested in. So, find 1-3 niches to start and get the top 100 category pages up on your device. Start by looking at the titles of the books and ask yourself are there any commonalities between them beyond the niche? Are they all trying to answer a particular question or discuss a viewpoint? Are there any arguments between different sections of the Top 100? Jot down a few notes. Take the ones in the top five or ten and open up their Amazon pages. For most books in the top rankings, Amazon will have a free “look inside” of the book if you click on the picture of the book. You’ll want to go to the previews and find the table of contents for each book. These tables can usually reveal broad topics that the author wants to talk about and that people are interested in reading about. These are ready-made and targeted topics that attract attention! Sometimes a TOC is hidden by Amazon or the author makes the titles a little too obtuse to grasp what the chapter is about. That’s when you go to the introduction. Most Amazon previews are long enough for you to get a sense of what the book is about to get some content ideas. Finally, look through the reviews of the books. Are people agreeing or disagreeing with the author? Why or why not? What is the book lacking? What needs expansion? By the time you get all this done, you should have a whole pile of ideas, concepts, and opinions that your audience should be interested in. 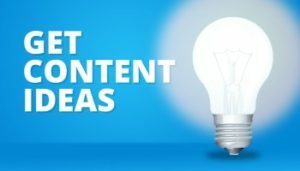 You should have a bunch of content ideas now. Time to compare them to what you have in your blog. If there’s a topic domain you’re missing, that’s an area ripe for an article or three. Maybe an older piece can be spruced up with new information. Seeing what people are interested now can help you look at your content with fresh eyes. This simple Amazon hack can turn up repeated dividends for content generation. Give it a try and see if you can break through your content writer’s block.